Burke arrives at Collinwood with an emboldened Sam and pressures Roger into finally confessing to the vehicular manslaughter that sent Burke to jail. He does so, and Burke leaves his fate in Liz’s hands. When Liz elects to call the authorities, Burke stops her with a newfound respect. That’s all Burke needed to see. Meanwhile, Jason learns more about the locked room in the basement from David. When Liz discovers him trying to get in, Jason ups the stakes of his blackmail, citing the night she fatally struck her husband and his own assistance in covering up the murder. It is implied that Paul Stoddard’s body may be in that locked room. Jason later calls Willie. Having misunderstood an overheard conversation about Roger’s culpability, Jason believes that he and Willie may be running out of time. Liz’s choice to turn Roger in has a strange, self-destructive, wish-fulfillment to it. After all, she now knows that both of Jamison’s children are successful murderers. This is a dense, chunky episode, uniquely satisfying in the DS canon. It’s an episode containing a refreshing resolution to Burke’s quest, and he shows a maturity that can only be gained after the events of 200 episodes. 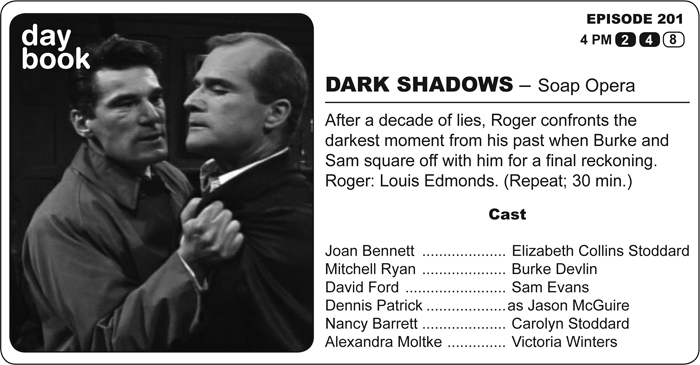 It also allows us to say goodbye to the snarling Roger Collins of old and clears the way for the more lighthearted, avuncular Roger of the Barnabas Era. An episode like this will do it. Roger experiences a visibly painful transformation in the episode, but you can tell that it’s a necessary and salubrious one. The ensemble shines in this one, but none as much as Louis Edmonds and Mitchell Ryan. Ryan dials up his usual intensity even further without leaping into self-parody. For Edmonds’ part, he very bravely delves into the most loosely hinged parts of Roger’s personality. It is a vulnerable, anguished performance that is utterly real and deeply uncomfortable to watch. Roger’s had just enough mellowing that seeing him humbled with extreme prejudice elicits a wince. That may be why Burke shows such surprising clemency. Anyone who wants to accuse DARK SHADOWS of having wooden or hammy performances needs to watch these two turns and call me in the morning. Today is also Don Briscoe’s birthday. Born in 1940, he was 27 today. Thinking that he had made it to thirty when he had his breakdown is even sadder. We miss you, Don.